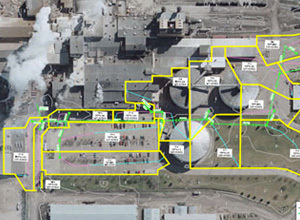 With multiple flooding and operational issues, American Crystal Sugar Company (ACS) retained AE2S to survey and document system layouts and profiles of the existing stormwater collection system served by yard pump station 5 (PS5) in their East Grand Forks facility. The goal of surveying the system was to prepare baseline information from which an analysis of the system could be performed in order to make recommendations on the most appropriate and prudent means to remedy the problems being experienced in this area of the plant. To analyze the system, AE2S stormwater experts constructed an XP-SWMM model to dynamically identify potential flow attenuation that may be present in the system (i.e., flow restriction via a potentially undersized or deteriorated collection system) and to identify deficiencies in the collection system that could be upgraded to better increase the overall efficiency of the system and minimize unwanted flooding in the drainage basin. The major system deficiency identified during the system survey was the substantial accumulation of sediment within the existing collection piping network. The sediment accumulation was likely due to two factors present within the existing system. The first factor was the relatively low existing pump capacity (3.35 cfs) in comparison to the relatively large system piping capacity (15.40 cfs under open channel flow conditions at the 27-inch inlet to PS5). The second factor contributing to system sedimentation was the inoperable state of the PS5 pump floats. Upon completion of the survey, drafting, and initial evaluation of the system, the results were examined and scenarios for modeling were developed. Improvements recommended as a result of the analysis included bringing the pump float system on PS5 back to an automated state to eliminate standing water within the system, upgrading system pumping capacity, implementing a subsurface connection from PS5 to a new pump station, and performing system jetting and sediment removal.